Every year staff and partners of the Garden Centre 'elects' a charity which is then promoted by various means throughout the year and this year the local charity, based in Great Horwood, Medical Detection Dogs has been adopted. Many of you will be aware that a series of their dogs, Barton, Alice, Whizz, Kiwi and Ember have spent some of their time training with Pauline and Richard at the Garden Centre before moving on to clients with type one diabetes, or with Kiwi to continue training on the Bio detection team and be at the Garden Centre when she is not 'working'. Customers will also have seen the dogs from the Medical Detection Centre in their distinctive red coats training in the shop and outside at the Garden Centre. With all the connections of the Garden Centre to this charity it seemed a good choice to try to raise some money for them and increase their profile with the public, as, not only are they always needing funds to continue their valuable work, but also more volunteers to help socialise the puppies. 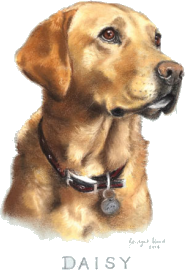 If you pick up one of their leaflets from the shop, or visit their web site, www.medicaldetectiondogs.org.uk, you can read in detail about the amazing work this charity is doing by working with the powerful scenting instincts of dogs to help detect and manage human disease. There are two aspects of their work, one to train and partner dogs to alert and support people with life threatening conditions, mainly type 1 Diabetes, but also Addison's disease, Narcolepsy and severe allergies where the dogs are trained to alert their partner so preventing dangerous medical episodes such as coma and anaphylactic shock. They are continuing to investigate other health conditions which the dogs may have the ability to provide assistance. Having met some of the people these dogs have been partnered with, it is amazing to hear how partnership with a dog has completely changed the life of the partner and in many cases their whole family. The other aspect of their work is training dogs in cancer detection. Their aims are to assist scientists through research into the development of electronic systems (E noses) that will assist in the early detection of cancer through cheap non-invasive tests. In the short term, the dogs could provide additional screening for cancers that are currently difficult to diagnose reliably, such as prostate cancer. They are currently studying the ability of dogs to detect breast and prostate cancer from breath and urine sample respectively and they have a multi-disciplinary team of eminent academics working. Kiwi is being trained successfully on the prostate cancer programme going in to the Centre at Great Horwood in the morning and being collected late afternoon to spend the rest of the time with Pauline and Richard. One could carrying on writing about the great things this charity has achieved and is achieving, but we need to make you aware of the things we are planning in order to help raise awareness and some money as well (we hope). The dog that really helped to launch the charity was one owned by Dr. Claire Guest, the head of the charity, whose name is Daisy, (pictured left) so Daisy will be our theme! T he plant Daisy is one of thousands in the Asteracaea (formally Compositae) family, so all hardy plants of that family on the Garden Centre will be marked with a label with the Medical Detection Dogs logo (pictured left) and when sold the tills will automatically allocate 10p from the value of the plant to the charity, and this is where we would like our customers to join in by donating a small sum to the charity. This will be completely voluntary, but if they would like to help there will be a Charity Collection tin by the till for them to put a donation in. There will also be a 'wishing well' (pictured right) available somewhere on the Garden Centre, but mainly in the entrance porch, where donations can be given. This will display some p ictures of dogs and partners to help make you aware of the work, and there will be a dispenser nearby with leaflets which can be picked up. We are also working out how to organise a 'Daisy Chain' competition, hopefully getting local schoolchildren involved, so keep an eye out for this. Medical Detection Dogs issue a periodic newsletter appropriately called 'Sniff' and in this we will be giving a special code which people can type in when ordering from our web site which will automatically donate a percentage of any orders made to the charity, and there will be an option for them to also donate when ordering. Very attractive notelets with a portrait of 'Daisy' are available for sale from the gifts department of our shop and all the money from sales of these cards will go to the charity. We hope to offer other ways to help this charity especially giving not only our local customers but also those throughout the country an easy way of helping, so keep your eyes and ears open for further news.